The sluice was a larger variation on the long tom, often as wide as 20 feet. At some point along the sluice was a grate of iron bars called a grizzly that worked to collect the large stones just as the riddle in the long tom did. Several sluices, one running into another, were often used to further refine the ore and even old tailings from the days of the rocker were known to produce a good wage when reprocessed. The Chinese, often barred from the more productive claims, were famous for making older diggings pay off this way. 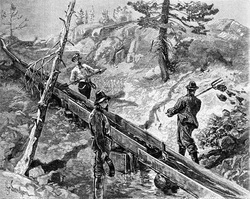 The use of a sluice to refine gold from the ore bearing soil required a constant stream of water. Men would dig ditches to divert a stream. They built dams and flumes, sometimes transporting water great distances to where it was needed. One common method of moving water was a wheel, much like the paddlewheel of a riverboat that was connected to a series of buckets on a belt or to a pump. In river mining operations where the stream was diverted so the bed could be mined waterwheels were common and often placed as close to one another as possible.